A portion of the Lagoon nebula imaged by Argentinean astronomers Julia Arias and Rodolfo Barbá using the Gemini South telescope with the Gemini Multi-Object Spectrograph. Released two years ago, this partial image of the Lagoon Nebula still remains an all-time favorite of astronomers and sky-watchers. The Lagoon Nebula (Messier 8, or M8) is among the most striking examples of a stellar nursery in our neighborhood of the Milky Way galaxy. Visible in small telescopes and binoculars its fuzzy glow reveals the type of chaotic environment where new stars are born. Argentinean astronomers Julia Arias (Universidad de La Serena) and Rodolfo Barbá (Universidad de La Serena and ICATE-CONICET) have used the Gemini South telescope in Chile, to obtain a dramatic new image of the nursery that could be described as psychedelic. Actually, since M8 is located some 5,000 lightyears away, the multi-hued scene is truly a psychedelic “flashback” as its photons had to travel through space for that same number of years before they reached the gigantic Gemini 8-meter mirror. Astronomers sometimes call the region imaged the “Southern Cliff” because it resembles a sharp drop-off. Beyond the “cliff,” light from a spattering of young background stars in the upper left of the image shines through the cloudscape. Arias and Barbá obtained the imaging data to explore the evolutionary relationship between the newborn stars and what are known as Herbig-Haro (HH) objects. HH objects form when young stars eject large amounts of fast-moving gas as they grow. This gas plows into the surrounding nebula, producing bright shock fronts that glow as the gas is heated by friction and surrounding gas is excited by the high-energy radiation of nearby hot stars. The researchers found a dozen of these HH objects in the image, spanning sizes that range from a few thousand astronomical units (about a trillion kilometers) to 1.4 parsecs (4.6 light-years), i.e. a little greater than the distance from the Sun to its nearest neighbor Proxima Centauri. 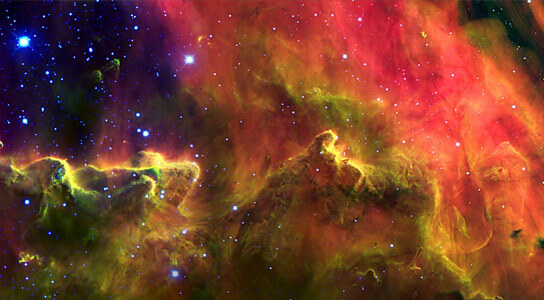 The picture –– a composite of individual images obtained with two narrow-band optical filters sensitive to hydrogen (red) and ionized sulfur (green) emission, and another that transmits far red light (blue) –– reveals in dramatic detail a glorious cloudscape of dust and gas surrounding this nursery of intermediate- and low-mass stars. Most of the newborn stars are imbedded in the tips of thick dusty clouds, which have the appearance of bright-rimmed pillars. The Lagoon nebula is located in the direction of the constellation Sagittarius in the southern Milky Way. Viewed through large amateur telescopes, it appears as a pale ghostly glow with a touch of pink. In this image, the use of selective filters to reveal characteristics of the gas clouds and the assignment of red, green and blue to represent each of three data sets results in myriad and strong color differentiation. Thus, the colors shown are not representative of the light’s actual color. For example, light from the far-red end of the spectrum, beyond what the eye can see, appears blue in this image. The Gemini Multi-Object Spectrograph (GMOS) on Gemini South captured the light for the spectacular new image from its perch on Cerro Pachón in the Chilean Andes. Be the first to comment on "Gemini Observatory Image of the Lagoon Nebula"